Calling all Red Sox fans! 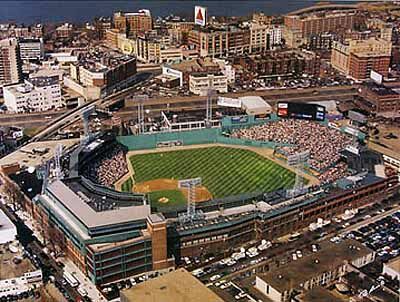 Tickets-for-Charity has a contest going on right now to win a private tour of Fenway Park. Ever wonder what lies behind the famed Green Monster? Or which players, past and present, have etched their names in its depths? Or maybe you've dreamed of patrolling the same outfield as Red Sox legends Yaz, Jim Rice and Ted Williams. TFC is granting one lucky follower access to a private tour for two of historic Fenway Park on May 25, 2011. The winner will have a chance to take an intimate walk around America's most beloved ball park, and enjoy lunch on Tickets-for-Charity. Enter for a chance to win now! Just include your email address and the name of the blogger's site you came from. Entries will be accepted until 6 p.m., Thursday, May 19. The winner will be notified on Friday, May 20. The tour is daytime on May 25 (time and precise details to follow closer to the date), and is pretty cool! It’s a private tour that includes both inside the Green Monster and on-field. There's only a few days left, so get to it. Pretty simple, all they're asking for is your email and who sent you .... which would be me .... Beantown Bloggery. I think i'll be entering myself. I'd love a tour of Fenway. 0 Response to "Contest: Win a Private Tour of Fenway"